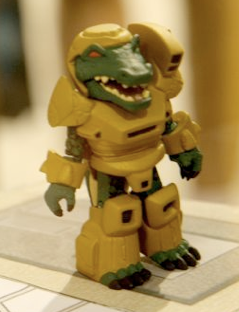 Inspired by the original Battle Beasts toy line, this Alligator is essentially a Minimates figure with special hands, feet, armor, and a hat. Given away by Diamond Select Toys at New York Toy Fair, 2010. The sample courtesy DST and our awesome pal Bianca. Reading "Battle Beasts: The Roar Rages On" on the bag, there's no sign of any "Takara" or "Hasbro" copyrights, which, we assume, means Diamond now owns the property. From all the reports out of New York, it seems there's no actual plan to release these at retail, but bagged sample figures like this one are making it out on eBay and elsewhere for quite a premium, with the first two reaching $100. The prices have since come down a little, but wait for our full review before shelling our your cash on this one. It's worth noting the figure has no name and no Fire, Wood, Water, or Suburst Warrior rub sign stickers like the originals. 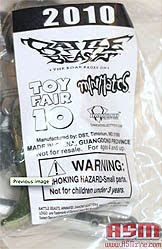 During the summer of 2009, Diamond Select Toys and Art Asylum confirmed, more or less, that they are planning to do Minimates based on the original Hasbro Battle Beasts toy range, also known as Takara's Beastformers. Anyway, at Comic-Con 2009, the very first (and so far only) sculpted figure that the public has ever seen was revealed and a picture got out to the web. This gold-armored, green-skinned gator was built off a basic Minimates figure, as underneath the gator head is a standard Minimates cylinder noggin and under the sculpted armor, tail, hands, and feet is a basic body. If nothing else, it shows just how versatile that body truly is. Reports got out that this figure will be bundled in the long-delayed Minimates Laboratory Playset which now seems to be pushed back to-- sadly-- January 2011. According to some sources, the figure will be named "Gator Guard" and the second figure in this set will be a Minimates M.A.X. Tactical Ops figure, which looks a bit like one of the troopers from Terminator Salvation.